Can KJ change Fee's mind?.. Camelot said the payout for the average Saturday jackpot would increase from about £4.1m to £5m. It defended the change, saying that charities, retailers selling tickets and government coffers would all benefit from the price rise. Around 60% of UK adults play the Lotto regularly, and annual sales across the lottery products account for more than £6bn annually. Charities and other good causes get 28% of lottery revenue, while 12% is paid to the Treasury. Small shops, which pocket 5% of sales, will also benefit. 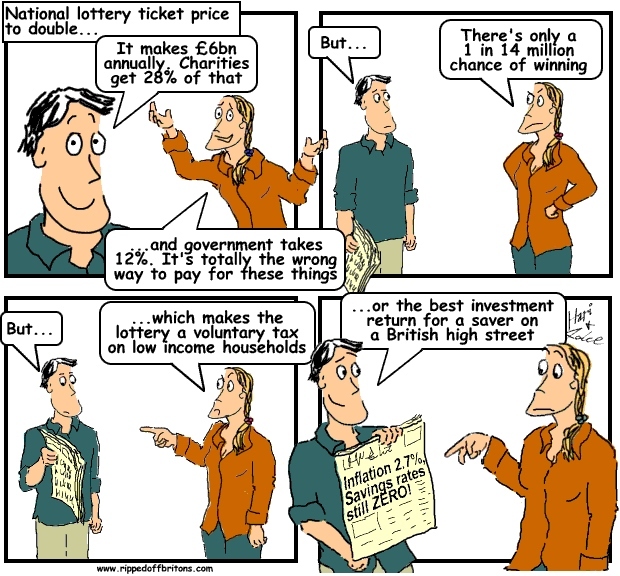 The lottery is a voluntary tax on low income households, say critics. A total rip off thats what it is, especially when you consider exacutives of Camelot are paid 1million pounds pa. + bonus. A monkey could run the lottery and it would still make a profit. The only reason it has gone up to £2 is pure greed its as simple as that. I have been living in UK for a while now some people actually many who pay online they never won more then £20. Camelot are guilty of miss selling advance tickets for an advertised Event Draw with a guaranteed winner for the 6th June 2014. This draw was an Event Draw to celebrate the anniversary of D DAY. Myself and many members of the public bought tickets for this Event draw in advance as it guaranteed someone wins even if no one gets all seven numbers.. Due to a May Euro-millions rollover not being won this coincided with the advertised one off Event Draw. Camelot cancelled the event draw saying that the rollover was bigger than the Event draw prize, however they failed to make this rollover a guaranteed winner draw. Having purchased tickets in advance for an advertised one off Event Draw which cannot rollover and must be paid out on the 6th June 2014 I feel I have been ripped off. I purchased in good faith tickets that were offered for sale prior to the event and advertised as a draw that would be won either by all numbers being matched or the next tier down etc etc. Camelot failed to deliver that prize and therefore I feel are guilty of miss selling deception and fraud.I complained to Camelot and they although initially they stated this was in fact an Event draw,have now changed stance and say it was a Super Draw. Fraud in any other name and as they profess to be the Champion of Good Causes , I note that the Good causes are supposed to receive 28% but in fact have never actually received a full 28% of the Prize money raised. What a shame D.Day has been tainted by another rip off Britain story. If you bought tickets for this draw save them and demand your money back. Bonito artículo, que has compartido aquí sobre el precio del boleto de lotería nacional. Me gustó tu forma de compartir este artículo aquí. Si alguien busca los resultados en linea loteria nacional, visite loteriasdominicanas.com.do.